What should be the factors informing U.S. strategy in the Arctic Ocean? One suspects the jolly old elf’s helpers have spent recent years fortifying the North Pole. Emplacing booby-traps around the perimeter. Aiming anti-ship and anti-air missiles toward every point of the compass. Refining anti-access doctrine and tactics. After all, governments from Moscow to Copenhagen now claim title to Santa’s frosty fastness. Even the Grinch of Asia, which takes a proprietary view of its own marginal seas and skies, has made occasional noises about declaring Saint Nick’s ocean terra nullius—territory available to all comers. What belongs to the Grinch belongs to the Grinch, that Christmastime malefactor whose heart is two sizes too small. What belongs to someone else is negotiable. Ho, ho, ho. Them’s fightin’ words. In any event, a non-elflike personage—Admiral David Titley, one-time grand wizard of U.S. Navy oceanography—is holding forth on Arctic strategy over at The National Interest. The bumper sticker for Titley’s essay might read like this: apathy and neglect toward the polar ocean typify American strategy. As a result, the United States trails behind would-be competitors in such areas as building icebreakers, constructing support infrastructure to help police the U.S.-claimed swathe of Arctic waters, and beefing up the U.S. Coast Guard. Washington can use its upcoming chairmanship of the multinational Arctic Council to help set the agenda among nations that front on or take an interest in polar waters. The rest is a matter of devoting policy energy to the problem and finding resources to back up policy. There’s little to quarrel with here. Wish someone had thought of it before. But since the admiral uses the s-word, why not kick the discussion up a level of analysis and appraise Arctic strategy qua strategy? Start with political geography—as always. 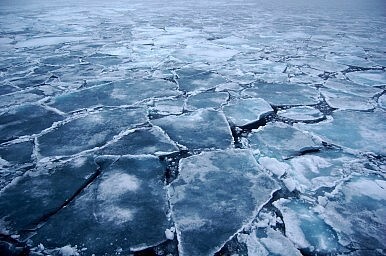 The Arctic Ocean is at once a peculiar and a familiar type of theater. It’s peculiar because it will presumably become a shapeshifter as polar ice advances and retreats with the change of seasons. Navigable zones, that is, will metamorphose from a narrow rim along the northern periphery of the Arctic nations into an ice-free zone each year (sorry, Santa), and back again. Shipping will be forced to reroute along different pathways to avoid a Titanic fate. Combat operations—if, heaven forbid, such ensue—would have to obey climactic realities as well. Surface warfare would be thinkable in summertime, while aerial and undersea warfare would predominate when the ice returns. A mix of surface, subsurface, and overhead operations would be thinkable while the seasons change. Strange. This warrants forethought. The Arctic is familiar because, in geopolitical terms, this semi-enclosed sea is a mishmash among the Mediterranean, Caribbean, and South China seas. It’s a semi-enclosed waterway ringed by an assortment of seafaring powers. That’s the common denominator. Unlike the Caribbean and South China seas, though, it’s not an expanse where one great power coexists—sometimes uneasily—with powers boasting far fewer diplomatic, economic, and military resources. The American and Asian middle seas are lopsided that way. Nor is the Arctic a sea with extremely limited access like the Mediterranean, where only one portal, Gibraltar, connects its waters to the world ocean. The other two entryways, Suez and the Dardanelles and Bosporus, lead only to other enclosed or semi-enclosed expanses. The Med, moreover, is bifurcated between prosperous yet militarily indifferent European states along its northern arc and relatively weak North African states to the south. Instead the Arctic Ocean is bordered mainly by advanced Western—indeed, NATO—powers plus a Eurasian power, Russia, that appears conflicted about what it wants to be. There are lessons to be drawn from the other middle seas. But in large part these lessons highlight differences that may prevail to the far north. All of these lessons merit scrutiny. And lastly, what would the canon of great works say about American strategy toward this familiar yet bewildering milieu? What Admiral Titley does, in effect, is exhort the United States to open a new, secondary theater to its north, in waters and skies abutting its shores. Clausewitz instructs statesmen and commanders to ponder the rewards, risks, and resources associated with such decisions. Are the gains from looking north, he might ask, “exceptionally rewarding”? Would Washington be jeopardizing its strategic positions in other regions—notably the Western Pacific and Indian Ocean, where it is supposedly pivoting—for uncertain gain, in a theater that may never warrant such risk? And does Washington boast such “decisive superiority” in these regions of primary importance that it can afford to divert sea-service and law-enforcement resources into the polar theater? Clearly some basic questions need to be asked, and answered, much as Santa Claus ponders his own defensive strategy. What does America hope to accomplish in this icy domain, what are the dangers and opportunity costs of seeking these goals, and where will the resources come from to seek them? Food for thought while you munch on holiday delicacies—and while Santa locks and loads. US Turns A2/AD Guns on China? Implements of land-based access denial are available. The US should seize it.